April 14, 2013 - Make sure you like EcoJoes on Facebook to stay updated on green ways to save money and help the environment. Just click the "like" button below. Muchas gracias! Ever since me and my life-partner, Tiff, moved into a house with a yard, I’ve had a garden. EcoJoes’s award-winning journalists have covered a plethora of gardening-related topics, including how to build a rain barrel and how to make some compost lasagna. It’s a good way to commune with nature, whilst growing some delicioso fresh vegetables n’ fruits. Unfortunately, sometimes nature communes back, and the garden pays the price. I’m talkin’ ’bout deer. For the last two years or so, deer have savagely ravaged my innocent garden, tearing the young, defenseless plants, flipping me the bird, and cruelly trimming plants down to bare stalks. Last year, eyes brimming with tears o’ fury as I looked over the remnants of my garden, I vowed to stand up to the deer. And lo, about a month ago on Freecycle, I found some coyote urine. I’ve heard from a few people that coyote urine could scare off deer, so we’ll see. Also, I have my doubts that “wild animals communicate” with bottles of pee. 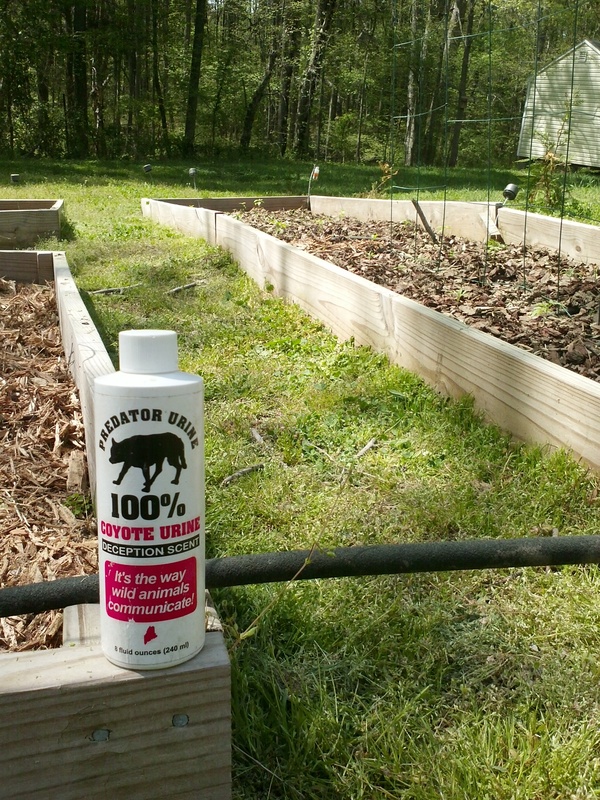 Will the coyote urine actually keep deer away from the garden? Or will they ignore it and continue to munch away? Also, how does one collect coyote urine humanely? Tune in next time for the exciting conclusion of Coyote Pee vs. The Deer. Posted in gardening	on Sunday, April 14th, 2013 at 4:21 PM. I've had it confirmed by someone from TEXAS, where the coyotes howl along the trail, that their urine WILL scare off the deer: it would me, for sure! Let us know, EcoJoe! I really hope it keeps them away; I know for a fact that other kinds of urine have no effect on them whatsoever. Mombai plays by her own rules, can't nobody tell her nothing!